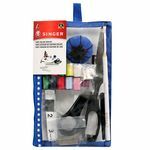 This great kit is everything a beginner needs to start sewing Kit contains 7" fabric scissors, tape measure, metal thimble, white marking pencil, seam ripper, 1" dressmaker pins 100ct, aluminum sewing gauge, 178" pinkblack tomato pin cushion, assorted hand needles 10ct, needle threader, 10yd spools of 100 polyester thread in 11 assorted colors, and a 5x9" designer pouch with two zippered compartments. Constructed of canvas and vinyl in pink and black. Size: 0.8" x 5.4" x 10.2"